1 in 3 youth will grow up without a mentor of any type. We’re a friendship-based, in school, youth mentoring program. We match caring volunteer mentors with students ages K-12 who will benefit from the encouragement and guidance of a mentor. Mentors meet with their student for 30 minutes each week. Inspiring lives while helping students discover their strengths to guide them toward personal and academic success. We envision a community where every youth will have a mentoring friendship and know with certainty that someone cares about them and wants to help. 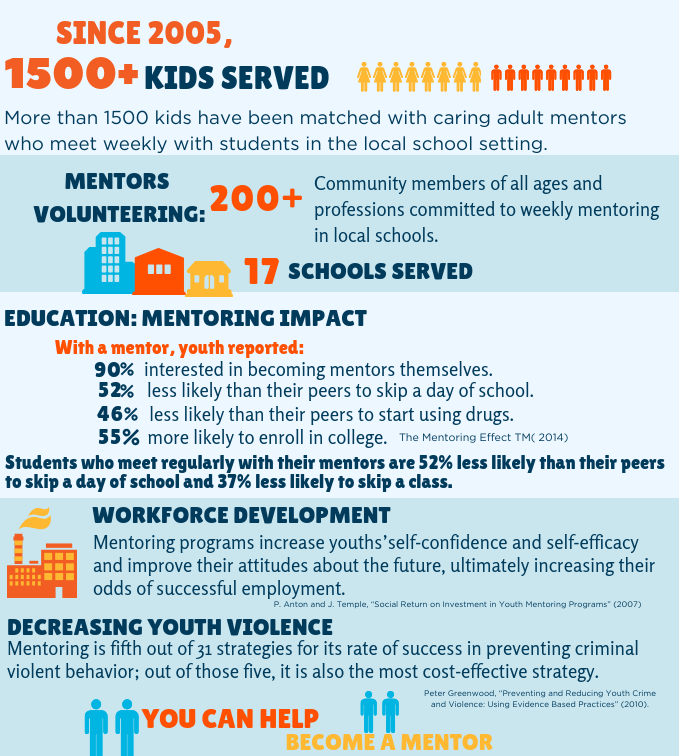 Youth mentoring is inspiring and impactful, both to the student and the mentee. We serve Jackson County School System, Jefferson City Schools and Commerce City Schools with caring, adult mentors. Our mentors have been building life changing bridges of friendship with students in Jackson County. More than 1500 students have been served since 2005. Ready to Inspire a life?